Oh how I’ve longed for my appetite to return! Food. glorious food? You just try and be a food blogger when you just don’t fancy any food? Virtually impossible to write about it when even your usual favourite foods make you feel ill! However glorious it is. So this blogger apologises for the absence of any blogs recently, but now I’m not only eating almost everything in sight but I have tactfully (I think) asked Erik to give me my rightful place back in the kitchen as Head Chef. 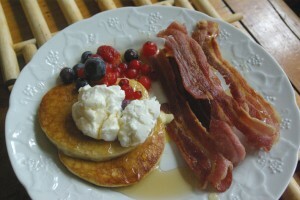 Mind you, the Breakfast meals below were prepared by Erik – maybe I ought to let him cook Breakfast every day now. Recently, bit by bit, step by step, my appetite had returned, and with a vengeance. Even for ‘trashy’ food sometimes. Would you believe that I had Ham, Eggs and Chips for my breakfast at our favourite Hornsea Mere Cafe! And although I have lost almost 2 stone in weight (amazing and thrilling), because I’m back to digging and weeding and just being more energetic, I’m keeping the weight off and determined to lose some more. Oh, the thrill of finding out most of my clothes are too big for me now!! My hair is slowly coming back, in a myriad of colours. It’s quite fun not knowing if I will be my usual streaky light brown, but judging by the colours at the moment, I will be, as they say in the horse world, piebald. Black and white! Should be different. But, thrills of thrills, my eyelashes are growing back, even thicker than before. And I have a bit of an eyebrow on the left, but, as yet, hardly any eyebrow on the right! I’ll just have to wait and see what happens, but at least I should have a warm head this winter. How we love going down our garden, snipping, picking or digging up the fruit or vegetables we have nurtured and nourished for months. Then deciding what hearty meals or delicacies we are going to create for each other and friends. You name it, we’ve got it. Well, not all of it. Yet. 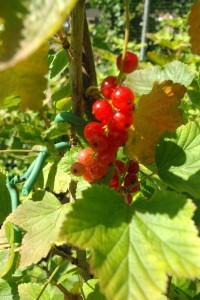 To start with, in our fruit cage, we’ve grown Redcurrant Rovada, which we have as a tall cordon (it takes up less space). We also have the very pretty Gloire de Sablon, a pale-pink sweet Redcurrant. Sharing the fruit cage we have various Blueberries, including a Pink Blueberry (which tastes of sweet sherbet – yummy) and a lot of Strawberries. Emily, our 5 year old granddaughter, just adores Blueberries, and loves both picking and eating them straight from the bush. Luckily there were plenty when she visited, so she managed to leave us a few to play around with! Erik was the chief cook this summer (due to my ‘indisposition’), and, bless him, he spent ages cooking trying to find something I could eat. So, guess what he cooked for me quite often? Yes. 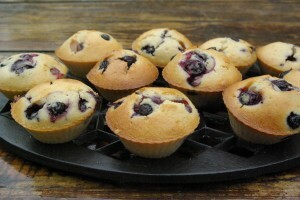 Erik’s light, fluffy Blueberry Muffins, with our own Blueberries. Crisp on the outside, juicy and soft on the inside. Just absolutely yummy. They certainly went down very well. 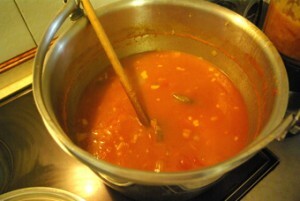 The other week, I suddenly found myself wanting to make my favourite Tomato Soup – gallons of it as I do most summers, whilst the Tomatoes are still sweet from the warmth of the sun. 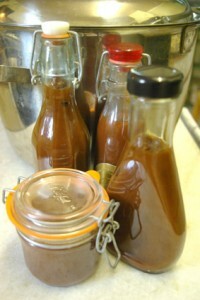 And Erik wanted to make Tomato Ketchup (taken from a Valentine Warner recipe). Because we haven’t managed to grow our own, due to me being poorly, we trotted off to William’s Farm Kitchen in Hornsea, and asked if we could buy a large amount of Tomatoes. 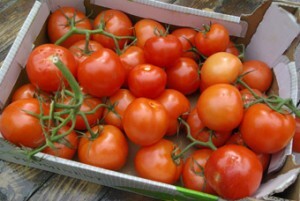 The reply was ‘Yes’, so home we came with the most gorgeous big, fat red ones – in fact a whole box of them. 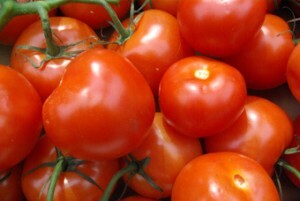 A few years ago, when we were lucky enough to eat at London’s River Cafe, we enquired as to why they had big boxes of Tomatoes outside, on the walls of the herb beds alongside the Thames. They said they always put them out in the sun, to make sure they were fully ripe. We love learning from the experts, so our Tomatoes ended up on our outside table on the patio, in full sunshine for a day or two to ripen fully, and it worked. OK. We are still a bit disorganised, to say the least. Because we had to put the garden-room extension on hold because of my illness, and our present kitchen is small, lots of our big pots and pans are on shelves in the garage. So the next job was finding the enormous jam pan. When we owned our cookshop, Kitchen Emporium in Beverley, we dealt with a supplier of good cookware, Hackman. The young lady rep was very helpful, and one day I asked her if she knew of a jam pan that had a lid, so it could double up as a large stockpot. She said she would ask, and a few weeks later brought us in a very substantial jam pan complete with handle and lid. It was, and still is, brilliant. I don’t think they went into production but it is incredibly useful when making a large amount of chicken or turkey stock, complete with bones. But also brilliant as a jam pan, or for such as a Tomato Soup or Tomato Ketchup pan. First to wash it then use it was Erik, for his ketchup. This was the very tasty end result. Then it was my turn. It had been months since I had attempted to prepare and cook anything with a lot of ingredients. Wash and chop or slice them, then simmer for a few hours, liquidise then work hard at straining the pips and final gunge through a sieve. I was exhausted, but the end result was worth it. Now, packaged in tubs, we have a winter’s worth of my favourite Tomato Soup, guaranteed to warm the cockles of anyone’s heart. Can’t wait until next year when I can use my own home-grown Tomatoes. Well, that’s the start of my blogging career again. 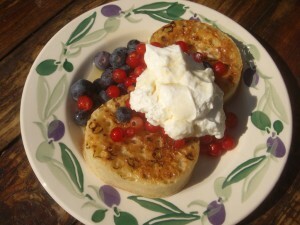 Because I’m feeling so much better, there is so much for me to write about, and I will definitely try and share with you any good offers or new products that come my way, especially in the cookware, kitchenware, cooking appliances, kitchen garden products and general doing – up – your – home and decorating bits and pieces. We have a lot of catching up to do. But before I finish, I just have to share this picture. Two months ago, Erik wandered down to the bottom of the garden. He rushed back into the house, so excited. So clad in wellies and a fleecy jacket (I felt the cold at that time), I carefully made my way through the garden. Erik had some binoculars and was looking up to the top of a big, and I mean big, tree. He kept pointing up to a split between the trunk and a branch, way up in the sky. At first I couldn’t see anything, but suddenly … here she is. Beautiful. What was amazing was that Mummy Owl was trying to teach her two grey bundles of fluff – her baby owls – to fly. 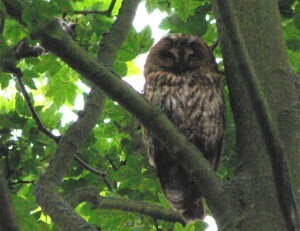 We could hear the cries of the babies, and even see them, perched precariously on the lower branches of our trees. Gradually one or the other little ones had a go at flying from one tree to another, with Mum keeping her beady eyes on both them and us. We tried to take a picture of the baby owls, but they just looked like a pale fluffy rugby ball wedged in the tree branches. Over the next few days they practiced under their Mum’s watchful eyes, then they gradually slept during the day, and during the following few nights we could hear their young calls, often quite near to our house. Mum would reply, reassuringly. It was quite special to both see and hear them. Hope you like the picture of our huge Mummy Owl. Now, I know the Owl story is nothing to do with Food, Glorious Food. But I thought you’d like it, like us. 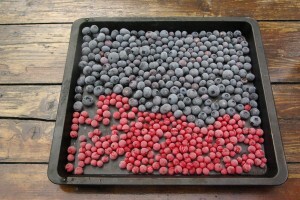 More Food and Kitchen Garden coming up very soon. Chemo finished, Appetite Returning …..
2 Responses to Food, Glorious Food.